Brief Synopsis – A group of treasure hunters find a sunken submarine and decide to use it to rob a passenger ship. My Take on it – This is a film that I’ve been meaning to see for quite a while since I always enjoyed Frank Sinatra’s heist films and this seemed to be part of that genre. 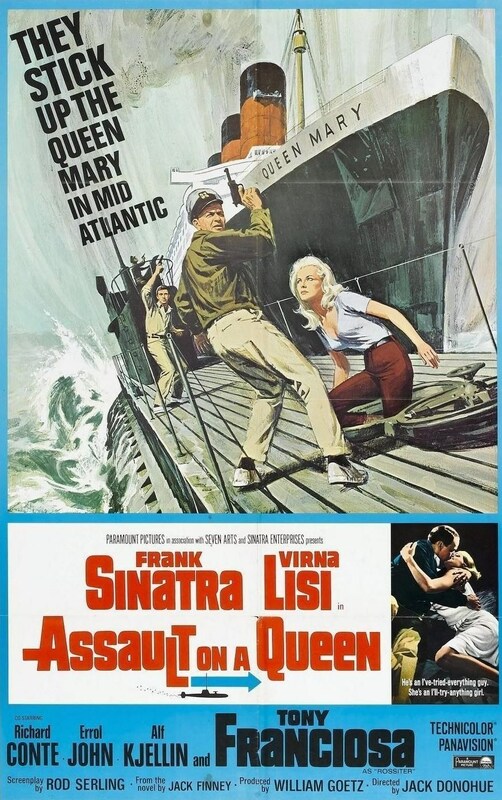 Unfortunately, this film is pretty mediocre and even Sinatra’s performance is so-so here. The rest of the cast all feel like they are lapping at Frank’s heels which doesn’t say much for their pretty mediocre performances here. I had much higher expectations for this film and was pretty disappointed that it feels so average the whole way through. The believability of the story is also a problem since it doesn’t seem realistic enough of a plan and it seems to be carried out pretty sloppily. I think there really is a good story to be culled from this premise, but this movie isn’t the answer. Bottom Line – This is a mediocre heist film that borders along the lines of believability. Sinatra is just ok here which is a bit disappointing. The rest of the cast feel like they are being held up by Sinatra the whole time and since this isn’t his best performance, it doesn’t say much about them. Expected this to be much better than it really is.